Just days after international media erupted when Japanese fishermen killed over 40 dolphins in a cove in Taiji, Japan, the hunt continues -- Sea Shepherd's Cove Guardians report that hunters have killed 25-28 striped dolphins in Taiji. This time, the animals were covered in a tarp before they were killed, to avoid the cameras of activists on the shore. "After being netted and corralled into the tiny confines of the killing cove, the killers draped a second net pulling the dolphins farther in under the tarps," the organization stated on their Facebook page. "As we continued to live stream the process, killers pushed the pod quickly under tarps and out of our sight." Those numbers add to the previous hunt from last weekend, during which 52 dolphins were taken captive to be sold to international aquariums while 41 dolphins were slaughtered for their meat. Boats search the open ocean off Japan's Pacific coast for pods of dolphins. When a group is located the fishermen drive them towards the cove by banging on submerged metal poles attached to their boat. This creates a sonar wall from which they flee. By positioning several boats in an arc, the hunters can funnel the creatures into a small bay. Once there, nets are strung across the mouth of the cove to prevent the dolphins' escape. Later on, the Sea Shepherd livestreamed a tour of Taiji, where they documented striped dolphin meat for sale. The news comes just days after the U.S. State department made a statement on the annual hunts, saying that they are "concerned with both the sustainability and the humaneness of the Japanese dolphin hunts." 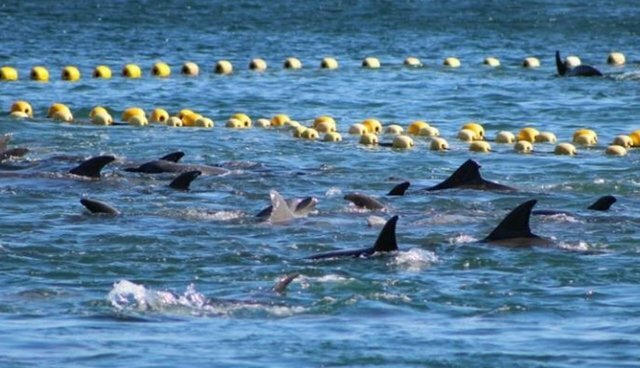 Dolphin roundups and slaughter -- brought powerfully to the public's imagination by he Oscar-winning documentary "The Cove" -- happen every year in Japan. You can visit Sea Shepherd's site to learn more about the problem. The organization has many ways you can help -- from volunteering to simply spreading the word on Facebook and Twitter. Sea Shepherd also encourages concerned citizens to call and write to the authorities in Taiji as well as the Japanese Embassy in your country, the U.S. Embassy to Japan, U.S. and Japanese Ambassadors to the UN and the U.S. Senate members of the Committee on Foreign Relations, among others -- all of their contact information is on this page. Another group involved in the issue is Earth Island Institute's Save Japan Dolphins.